The RHI Tariff increase confirmed! As of 20th September 2017, the Government have increased the Renewable Heat Incentive tariffs, which is excellent news for those homeowners looking to change their current heating system to either Air or Ground Source Heat Pump technology. People who join the scheme can receive quarterly payments for seven years for the amount of clean, green renewable heat it’s estimated their system produces. Since opening in April 2014, the scheme has already seen thousands of people successfully join and receive payments . 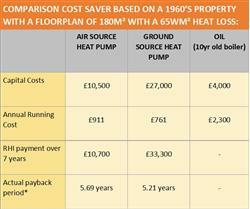 You can see some of the completed Reina Group Heat Pump case studies here. Other important changes involve new heat demand limits, which are put in place to ensure that payments are offered on the renewable portion of the heat demand, in line with the current schemes rules. Other changes have also involved new regulations requiring heat pumps to have electricity metering arrangements installed. This will allow for better accreditation applications for the devices, and enable customers to better monitor their heating systems performance. These new changes mean that there is more incentive than ever for homeowners to invest in heat pumps. With increased financial incentives, not only can users expect to get increased return on investment, but also continue to help encourage greener heating solutions and make their property more environmentally friendly. The southern counties are leading the way! In a recent report made by Ofgem the South East and South West of England homeowners are leading the way in converting their existing heating system to renewable heating technologies, in their home. The report also states that Air Source Heat Pumps are the more popular than any other renewable heating system with a total of 28,038 accreditations last year. The Reina Group are at the forefront of renewable heat pump design and installations and have achieved MCS approved installer status for heat pump installations. MCS accreditation gives greater consumer protection and allows our installations to be eligible for government grants. We can design and install a complete renewable heat pump package, with full co-ordination and a single point of responsibility, resulting in the smooth running of projects and effective long term use of our heat pump installations. The Reina Group has vast experience in the supply and installation of heat pumps across a range of sectors including domestic, rural, commercial, public sector and community projects. • The Reina Group are at the forefront of renewable heat pump design and installations. • We are MCS approved for all heat pump installations which gives greater consumer protection and allows our installations to be eligible for government grants. • We provide an excellent maintenance and servicing support. • Our highly skilled Heat Pump engineers are professional, experienced and courteous. • Our dynamic team have great vision and offer value engineering solutions. • At the Reina Group we offer both approved installation & servicing programmes relating to the industry’s leading manufacturers, for both air & ground source heat pumps. This includes brands such as Thermia, Danfoss, Daikin, Nibe, Vaillant, Stiebel, Kensa, and Mitsubishi. If you would like to receive more details on any of the Reina Group Products or services please either phone us on 01303 248648 or email us on info@reinagroup.co.uk.